My good friend Kayte (of Kayte’s Kitchen) told me about these muffins awhile ago and I thought they sounded really good, but then I forgot about them! She gave me the recipe again yesterday and I was able to make them today. For me, they definitely taste “healthy” (maybe because the only other muffins I make include about 2 cups of sugar and a cup of oil?) but they are so moist and really good! 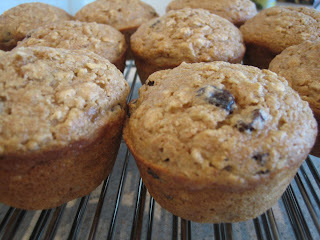 I added the optional raisins and am glad that I did – they give the muffins a little more depth and flavor. Also, I took Kayte’s advice and mixed these with a wooden spoon instead of using a mixer. I definitely see the potential for them to be over mixed and come out tough! 1. Soak the oats in milk for approximately 1 hour. 2. Preheat the oven to 400 degrees. Spray a muffin pan with non-stick cooking spray. 3. Combine the oat mixture with applesauce and egg whites, and mix until combined. 4. In a separate bowl whisk together dry ingredients. 6. Spoon batter into 12 prepared muffin cups. Combine cinnamon and sugar and top each muffin with some of the mixture. 7. Bake in preheated oven for 20-25 minutes or until done. These muffins are so delicious - you have to try them!